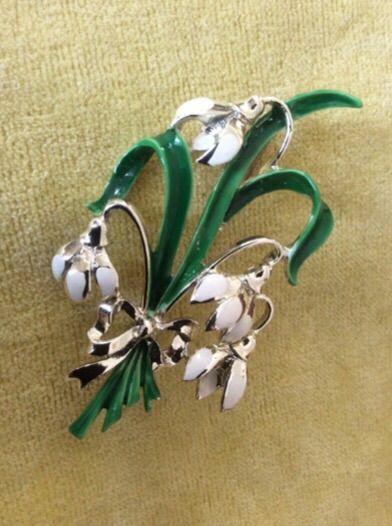 Here is another really delightful 1960's vintage cold enamel brooch in the form of a Snowdrop with three detailed leaves. 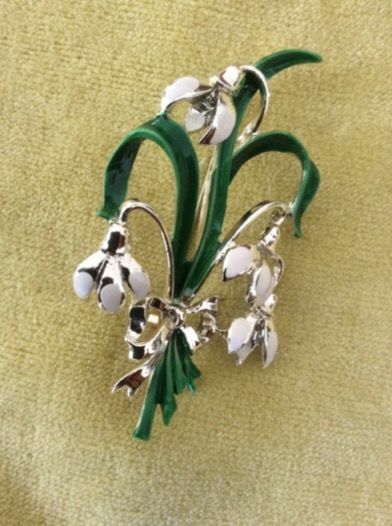 The Snowdrop Flower Brooch has four fully opened blooms in a gold tone metal finished with a white cold enamel and the three leaves are finished in green cold enamel. 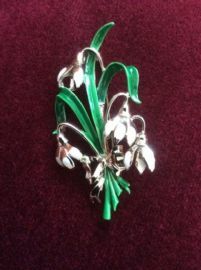 This Snowdrop brooch is from the Original Range of Birthday Flower Brooches and the Company's sales leaflet lists the flower pins available and their Registered Design Numbers. The brooch is in very good vintage order. This 1960's brooch is one of the harder to come by designs from Exquisite Jewellery Ltd., of Solihull, Warwickshire, England. They also made a series of Leaves pins and matching earrings and other costume jewellery. The vintage snowdrop pin measures almost 2.75 inches by 1.5 inches and fastens with a secure roll over type clasp. 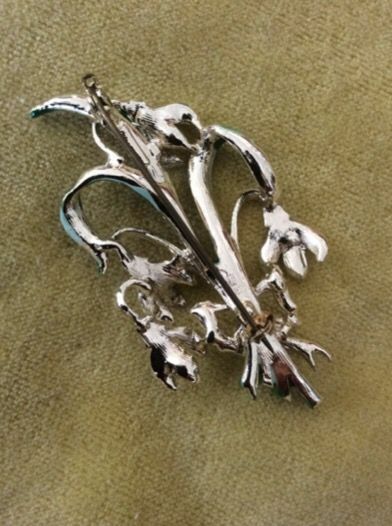 Perfect for gifting or keeping in your vintage and antique costume jewelry collection! I have included the photo and details of Exquisite's New Snowdrop Brooch just for interest as a related product. That version has fewer flower heads.